Yoenis Cespedes, the highly regarded Cuban outfielder signed by the Oakland Athletics, has agreed to an autograph deal with Topps that will see his signature included in several 2012 sets. The first Cespedes autographs will be inserted in 2012 Bowman Baseball as a part of the Bowman Lucky Redemptions program. The A's rookie has already been announced as redemption number one so collectors won't be left guessing when the set releases in early May. 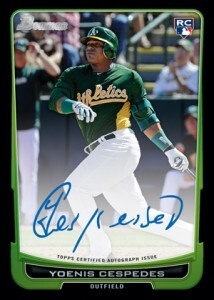 Topps also promises Cespedes will have regular cards in 2012 Bowman Baseball as well. Other upcoming sets collectors can expect to find the fleet-footed slugger's signature in include 2012 Bowman Platinum, 2012 Topps Allen & Ginter, 2012 Topps Chrome, 2012 Topps Finest, and 2012 Topps Tier One. As a participant in the 2009 World Baseball Classic, Cespedes has several Topps cards already. However, as inserts, none are considered rookies. 2017 Triple Threads Yoenis Cespedes "Grand Slams" Gold Relic Patch 7 9 "NY Mets"